Home / Latest / Sacks: What Is Anti-Semitism? Anti-Semitism is the least creative thing you can think of and the most destructive. But in a sense, anti-Semitism survives because of a weird and dangerous kind of creativity. Let me explain why. It seems to me that if you actually ask, “What is anti-Semitism? What do anti-Semites believe?” you will immediately see that the answer is a series of contradictions. Jews were hated in the 19th century because they were rich and because they were poor, because they were capitalists and because they were communists. Because they kept to themselves, and because they infiltrated everywhere. Voltaire hated Jews because of their superstitious faith. Stalin hated Jews because they were rootless cosmopolitans who believed nothing. So anti-Semitism is a series of internal contradictions, and it can be understood only on the model of epidemiology. Anti-Semitism is a virus that infects the body politic. Now, the body has the most remarkable, sophisticated system for detecting and defeating viruses that one can imagine: the human immune system. And of course, the way viruses survive is by mutating. And anti-Semitism is a virus that, by my calculation, has mutated three times in the course of 2,000 years, and we are living through the fourth mutation. So the return of anti-Semitism to Europe within living memory of the Holocaust is an extraordinary effect, because after the Holocaust, Europe made the most determined attempt that any civilization has ever made to create an immune system that would guarantee “Never again.” So anti-Semitism has returned despite at least 50 years of anti-racist legislation, more than 50 years of interfaith dialogue, and 50 years of Holocaust education. And yet it has returned by mutating. And let me therefore explain to you what makes the new anti-Semitism different from its predecessors. Three things. Number one, in the Middle Ages, Jews were hated for their religion. In the 19th and early 20th century, they were hated for their race. Today they are hated for their nation-state, and that is radically new, and that is what makes anti-Zionism. Not criticism of Israel. I mean, for heaven’s sake, I don’t know any Israeli who doesn’t criticize Israel, so criticizing Israel does not make you an anti-Semite, but anti-Zionism. The idea that Israel alone — I mean, there are 102 countries of the United Nations in which a majority of the population is Christian. There are 57 members of the [Organization of Islamic Cooperation]. That Jews should have one country of their own is one too many — that is the new mode of anti-Semitism. Second, believe it or not, it is very difficult to justify hate in public discourse. We have a moral sense. And therefore, it’s quite difficult. Therefore, throughout history, anti-Semites have always been forced to turn to the single most prestigious source of authority in a culture at a given time. In the Middle Ages, clearly the most prestigious source of authority was religion. And therefore, anti-Semitism was religious anti-Judaism. In 19th century, post-Enlightenment, scientific Europe, religion was no longer the most prestigious source of authority. Instead, what was the most authoritative? It was science. And so anti-Semitism was justified on the basis of two disciplines that were thought of as sciences in their time, although they are absurdly not so in retrospect: the so-called scientific study of race, a mix of anthropology and biology. And number two, Social Darwinism — Spencer in England, but Haeckel in Germany — that the same law that applies in biology applies in society, that the strong survive by eliminating the weak. After Hiroshima, science was no longer the most pristine source of authority. Indeed, after the Holocaust, the highest source of authority has been human rights. And that is why, in the somewhat notorious World Conference Against Racism in Durban in August 2001, one week before 9/11, Israel was accused — certainly among the parallel NGO conference — of the five cardinal sins against human rights: racism, apartheid, crimes against humanity, ethnic cleansing, and attempted genocide. An assault on Jews and Israel must be couched today in terms of human rights. The third difference is that the carriers of anti-Semitism in the Middle Ages were the churches. In the 19th century there were national cultures, so it makes sense to ask, “Is France, in 1880 after Édouard Drumont’s ‘La France juive,’ or Germany, or Austria, are they anti-Semitic countries?” Because the carrier was national culture. Today it is not a national culture. Today the carrier of anti-Semitism is the Internet, and that can influence very small minority groups who can perpetrate, God forbid, the most tremendous suicide bombings, as we’ve had. So you know, there’s no connection between the degree of anti-Semitism in a country and its spread in an overall population. In all the recent surveys, Britain emerges as a less anti-Semitic country than the United States; the least anti-Semitic country in Europe is Denmark. But these are countries with vehement anti-Israel biases. So this is what is a little bit shocking about the return of anti-Semitism to Europe within living memory of the Holocaust. And is it serious? It’s serious enough that eight years ago, in May 2007, I had the opportunity to address together the three heads of Europe: Angela Merkel, who was chairing the European Commission; the head of the EU, José Manuel Barroso, and Hans-Gert Pöttering, the head of the European Parliament in Strasbourg. That was eight years ago, and things have gotten worse since. So the situation is this: That the political leadership of Europe know there is a problem, but they do not have a solution. That is what is worrying. It’s not lack of will. It’s lack of knowledge of how to cope with this new and very different mutation. The really bad way of responding is to allow ourselves to be dismayed by this. Because that’s what our enemies want and, Baruch Adoshem, Thank the Almighty, we’re pretty predictable guys, you know. Jews get together. What do they do? They say, “You know what? The world hates us.” And that makes us feel quite good about ourselves. But I mean, the truth is that is not a creative response to the problem, so let me suggest, therefore, three creative responses. Number one, in April 2002, when all this was beginning, I called in the leadership of the Union of Jewish Students. This was after the suicide bombing in the Park Hotel in Netanya, as they were sitting down to begin the seder service. You remember in 2002, Israel went in, and there was this terrible libel, really, about [the Palestinian city] Jenin, where there was supposed to be a massacre of 5,000, and then they said it was 500, and in the end 52 Palestinians and 23 Israelis died. But I called them in and I said, “The months and years ahead are going to be difficult, and I want you to know that we are going to be alongside you.” We stayed very close to our Jewish students. We didn’t leave them to fight the battle alone. I went out there into the campuses. Whenever there was a bad scene, I would go and speak to what we call university vice chancellors, what you call university presidents. We had pretty zero tolerance for this kind of stuff. But I said to them, “These are going to be times of anti-Semitism. I want you to do the unexpected thing: I want you to lead the campaign against Islamophobia.” I think in psychotherapy they call that “paradoxical intervention.” It’s the least expected thing. And fascinatingly, they ran with it, and out of it emerged an organization called “The Coexistence Trust,” Jews and Muslims fighting anti-Semitism and Islamophobia together. It began at that meeting of university students. That was a little ray. It was a little fragment of hope done by doing the unexpected thing. You will see that everyone is different, and that’s true. But Jews were the only people consistently throughout history to insist on the right to be different, the dignity of difference. They were the only minority consistently. Not always, but for the most part, they refused to assimilate to the dominant culture, or convert to the dominant faith. They were the most conspicuous non-Christian population in a Christian Europe, just as today they are the most conspicuous non-Muslim presence in a Muslim Middle East. Jews were hated because they were different, but difference is what makes us human. It is the fact that each one of us, even genetically identical twins, is different. That makes each one of us irreplaceable. It is our difference that makes every human life “a universe.” And it is the difference in every culture that makes every culture unique, special, and have the non-negotiable right to exist. Every single human being is holy, and every culture is special, because it’s different. So a country that has culture that has no room for Jews has no room for difference. It therefore has no room for humanity. So anti-Semitism is a hatred that begins with Jews, but never ends with Jews. And that is why we have to stand together, with as many friends and allies as we can, with Christians, with moderate Muslims, with Sikhs, with Hindus. Hindus feel at least as threatened as we do. Sikhs are wonderful; they feel like the Jews of India. They’re caught between the Muslims and the Christians, so they say, “You know what? We must be Jewish.” They’re terrific, see? And they wear bigger yarmulkes than us, but they’re really great. And it is Christians who are the primary victims right now. In the Middle East, there’s the religious equivalent of ethnic cleansing of Christians taking place in one country after another. I’m not going to bore you with all the facts. And as for Muslims, 90 percent of the victims of Islamists today are Muslims. So let us find that common ground and reframe anti-Semitism, and see it for what it is: a crime against humanity because of an inability to make space for difference. And thirdly, the third creative thing we must do is to accept that anti-Semitism happens to Jews, but never to allow it to define what it is to be a Jew. The late Jewish theologian Emil Fackenheim formulated something which he probably didn’t take all that seriously, but became the leitmotif of a generation, that a 614th command has been added to the Torah: “Thou shalt not hand Hitler a posthumous victory.” I mean, never was a more negative definition given of a people’s raison d’être. Do not internalize anti-Semitism. It happens to Jews, but it’s not who we are. So let me end therefore on a note of hope. Well, they don’t know what to make of this, but five rubles is five rubles, so they go away. They take the money; they go away. Well, again, they don’t know what to make, but a ruble is a ruble. And they never shouted “Jew” again. This piece was adapted from a speech given at Moment‘s first annual Judaism & Science Symposium on April 12 in Palo Alto. 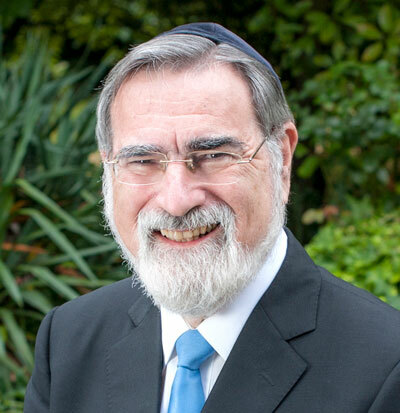 Rabbi Lord Jonathan Sacks served as the Chief Rabbi of the United Hebrew Congregations of the Commonwealth from 1991 to 2013. He is the author of the upcoming book Not in God’s Name: Confronting Religious Violence. Rabbi Jonathan Sacks is worthy of his title. Thanks for a well written synopsis. Why is Rabbi Sacks smiling? We are NOT defined by our enemies. We have self determination about what we believe and who we can trust. Education doesn’t really educate people. Brainwashing for 1000 years of westerners and Muslims has produced hateful humans who need Jeews to blame for their self belief that they are the religious victims. Antisemitism is morphing again as anti Zionism, anti Israel, but really it’s anti semitism, anti Jew. We need Rabbi Sacks to speak loadly against this hate in the West and around Israel. Just a small point: even if 90% of the victims of Islamists today are Muslims, this does not imply that those victims will empathize with the desire for Jews to have a state of their own in the Middle East, however much we express sympathy for their plight. There are religious roots of antisemitism in Islam which mean that the enemy of my enemy is not necessarily my friend- they may well also be my enemy. 1Major differences between Jews and the rest of the world. with a high percentage of Arab students we rere requested to donate to bursaries.They expect Jews with a long tradition of taking care of teir own should contribute to their needs. A cause for antisemetism. should forget the Holocast and carry on with their lives.Nachum Goldman scrached his head and thought for a while and then remarked .”How do you expect us to forget the Holocst when the Christian World for over 2000 years continues to blame us Jews for the death of Christ!”Briliant -but wone of the bases of antisemetism. if it ever falls into Abu Mazems hands leadeadership will also be cleansed of all Christians and minorities. 5Muslim plans to take over the world .